All you read was giveaway, am I right? well I break for giveaways too so I can't complain. I really do want to this share this book with you. More Take 5 Quilts by my lovely friend Kathy Brown. Isn't it bright? totally my style. or rather best to feature. 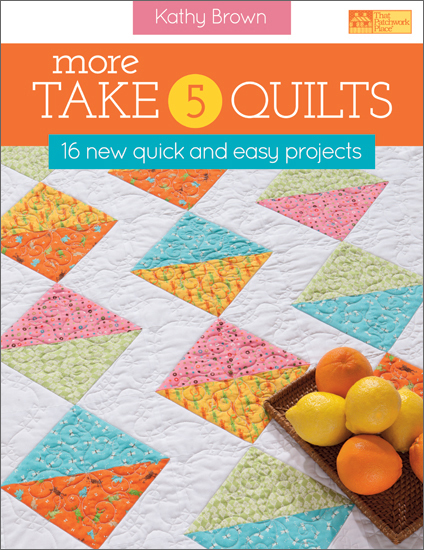 that Kathy has released two new quilt books in less than 12 months! I have a feelin' there's A LOT more coming in the future. In the mean time, we can enjoy this book. I am going to make this 'giveaway' a bit more "work". 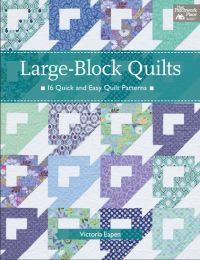 I would like to know what 5 fabrics you would pick to make a quilt in this book. I'll choose a winner on May 8th. Please make sure there is a way to contact you in case you are the winner. Hello! looks like a great book! I'd choose a white solid for the background and 3 printed fabric from... Meadow Friends (thinking of a baby quilt). Thanks for the chance! This book has some sweet patterns!! I would choose Shimmer and a midnight solid to make a lap quilt. Thanks for the opportunity! Fun! I'd use Kona ash, and then the red floral and yellow floral from Reunion, the yellow and red kind of pinwheely print from Hometown, and then either a chevron or polka dot or gingham from one of those lines. Oh Boy!! I would use the picnic party line. I love lady bugs and I love that fabric. thanks for the chance to sneak peak and win. I think I'd use 4 different polkadots from the ta dot line by michael miller, sunny, lipstick, lagoon, and kiwi to coordinate with the out of print Starling fabric I have in the cupboard--I've been hoarding it but many of these patterns look great for showcasing larger prints! 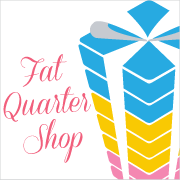 I bought a package of polk-a-dot fat quarters...I would pair those up with a Kona white and go for it!! Lovely book! oh that does look like a great book, if I don't win,I'm gonna have to get this one. I'd use a kona white solid and pezzy prints for the twister quilt. Man wouldn't that be so cute??? I would pair 3 of the prints with two kona solids and make ME a quilt!! This looks like a great book. 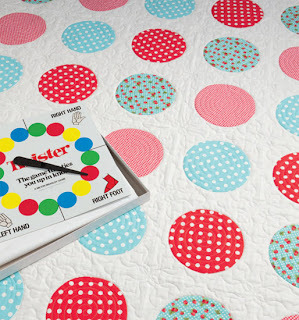 I think a fun summer quilt would be one made with a bright white solid and assorted colors of "Dottie" - polka dots are just fun. Thanks for the chance to win! 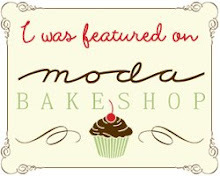 I would use some of moda's sassy prints. i love that simple cover quilt - i think it would look fab with some of the vintage modern line from bonnie & camille, i don't know the fabric names but i love the herringbone, dot, floral and rectangle prints. and white sashing of course. This looks a great book. I`d choose white solid fabric for background and California girl fabrics.thinking in a summer quilt.Thanks for the chance!! Mission successful!! 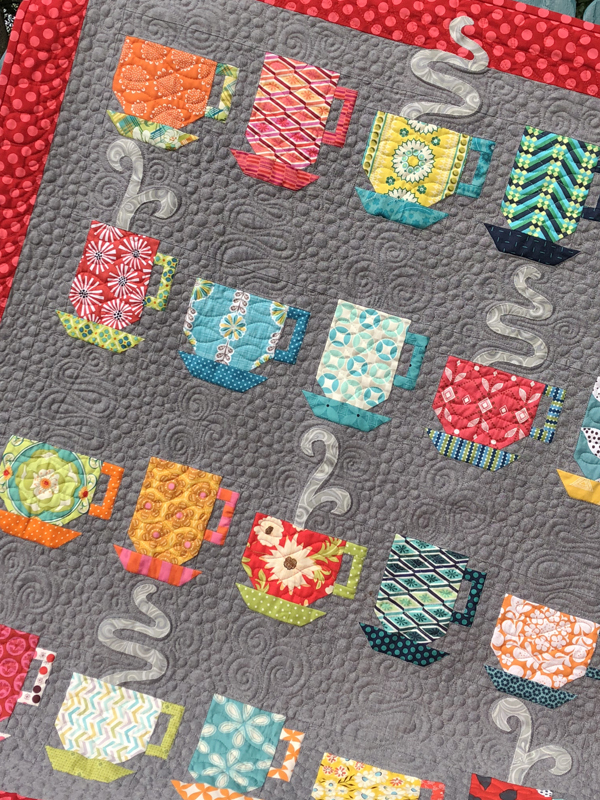 I've spent the last hour dreaming about all of the fabulous quilts from all of the wonderful new fabrics out there! I hit all three sites but came back to the Ebony Ginko and would pair that up with either a black or a cool gray...dreaming.. I like to shop for fabric on Etsy...and I always love looking at bundles. I window shop quite frequently! Thanks for a chance to win...that book looks like it's full of quilts I could actually make! LOL...I actually came for the book review and got a reward! I absolutly love Take 5 and was curious how the new book was, looks like a must buy! Thinking I would love to use some of the new Riley Blake, Apple of my Eye, with aqua as the background. Sound oh so fun! I love the London Fog batiks. Beautiful! It is hard to pick just 5 fabrics. I am really loving the new Quilt Blocks prints though. So I think I would choose the chevron print with gray, and two more prints from the line and a couple solids to match. Any of the Petal Pusher (bright palette) by Dear Stella House....love, love, love these! Hmmm, maybe 5 different Dotty fabrics from my stash? Hmmmm, that's tough. what would I use. I really liked "Annie's Farmstand" but I never bought anything. I love the gingham in the line. If I had it in my stash, I would chose from that. Since I DON'T have it, I would go dotty. I've been collecting a rainbow of dots and I should probably put them to good use! Thanks for the chance! Oh I am a dotty girl for SURE!!! So that would be my choice with a solid white background to "quiet" my dottiness!!! Would LOVE LOVE LOVE to win!!!! HELLO! I'D CHOOSE DURHAM ANEW'S ROSE FLORALS AND AN OFF-WHITE SOLID. THE GIVEAWAY BOOK LOOKS SO NEAT! Triangles in Blue, Triangles in Gold, Walkabout in Blue, Blooms in Blue, and Hearts in Pink. I might want to switch Hearts in Pink with a white solid. Looks like a great book to win so count me in! Thanks for the giveaway. I have some Sherbert Pips that I would use along with some bright solids for the quilt on the cover. Thanks for the chance to win a copy. I don't know if this line would work, would have to look at the book first, but I just found this line at the FQ shop and love it in the green/grey colorway. Thanks for the giveaway! Nice quilts, looks like a great book. I would choose 3 prints from Vintage Modern. I think I would use a black solid for the background and some of the shimmer fabrics by timeless treasures. They are gorgeous! I would love to make it with my all time favorite fabrics - Boutique by Chez Moi, but I doubt I can still get the fabrics I need - the floral (in orange), the mall dots in green, the small florals in bluses, the dots in orange and then a white Kona solid. How about some fabrics from the 'Cocoon' line and some 'Play Date' dots?? I would use a mix of fabrics from the London line by Makower UK ... http://www.hawthornethreads.com/fabric/designer/makower_uk_/london. What a treat it would be to win this book! 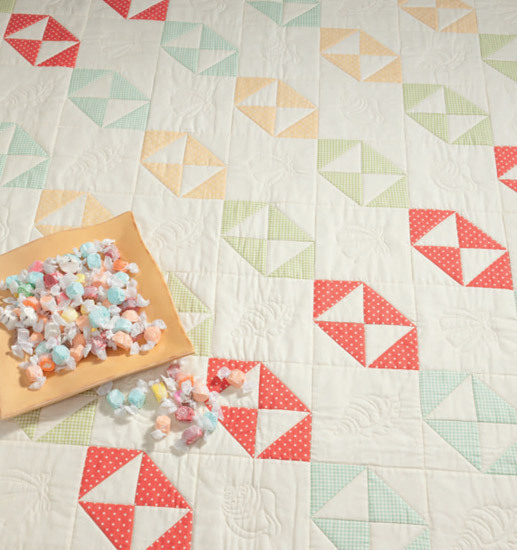 For the cute Half square triangle quilt on the front cover, I would choose bright colored snowflake polka dot fabrics from Just Believe by Dianna Marcum for Marcus Brothers Fabrics. They would look bright and awesome. thanks for a chance to win. I just bought the fabric line scoot...so I would choose and solid and four of the scoot fabrics (a red, blue, green and yellow. I would choose an assorment of four fabrics from the Apple of My Eye line and solid white. I would use some of the prints from Vintage Modern by Bonnie and Camille. Thanks for reviewing this book! I have made those beads! Love your block! I have been wanting to make a black, white and lime quilt, so I would choose Tempo Lime by Benartex. I would use four brights from the Pezzy Prints line combined with Kona White to make the Salt Water Taffy design! Love it!!! Thanks for the chance to win! The book looks wonderful. Gosh it would be hard to pick fabric. I think I would have to go with purples, pinks, and either orange or yellow. Definitely more baby soft colors though for my niece. I think I would use Apple of My eye by The quilted fish. I would use the blue palette. I love the floral is that line. Well, I am smitten with Flea Market Fancy at the moment, and I do have a bunch of solids coming my way, but....I think I would use the Riley Blake Scoot that I picked up this spring. Something about a kid's print goes with the simple designs of these quilts. I've been in a neutrals mood lately and would start with something from the E.E. Schenk "Serenity" taupes and bring in a spa blue and a chocolate brown. I know those colors have been "done to death," but I still find them attractive. And I haven't made a quilt with them yet! I'm on a "Me and My Sister" kick at the moment, and since I'm needing to make two quilts for twin sisters, I think I'd do one colorway, with matching Moda Marbles, for one, and another for the second one. Both would have to have a white background to make them "pop," though. :) I can't wait! Ok, I just spent forever looking at fabric at Hawthorne threads (thanks for the link, it's new to me), easy to get carried away. I usually don't buy fabric specifically for a quilt, like to pull from what I have (I tend to buy what I like when I see it, with no particular purpose in mind) and then add on, but I think I could use Savannah Bop for all five fabrics to make a quilt from this book. I just loved the design. I usually like to have more than 5, to make a more scrappy looking, interesting quilt. THanks for the chance to win! Well, I love polka dots, so I'd use polka dots, a white solid and a black solid. I would Picnic Pals by Alyssa Thomas At Penguins and Fish.. It is SO cute! Then I would have to have a solid to go with the bright prints. I would pick a lovely creamy print for the background then some pretty ones from the California Girl by Fig Tree quilts line. Love the colors. Thanks for the chance to win the book, looks very nice. I'd use the new range "Pick a Bunch" in orchid,aqua and sunflower with a co-ordinating marigold and Moda Snow solid! Lovely! I would choose 4small prints from Ten Little Things and a pale blue background. Thanks for a chance to win! I would use a white back ground and some terrain. Oh, gosh, so many lovely patterns in the Take Five book! I would use Deb Strain for MODA's "Happy Howloween line. I would pick "Orange Hoters," "Midnight B&W Sky," "Candy Corn," Midnight Black Dots," and "Moss Green Night Sky." I love fall/Halloween themes and these 5 colors would be great in any pattern from the book that calls for five. Michael Miller's Fairy Frost that I have in my sable. Wow - tough to choose! I would pick a large Kaffe Fassett floral, a medium floral, a coordinating serapi stripe, a dark solid and a pale solid. I would probably use 4 fabrics from the rhapsodia line by pat bravo and then a coordinating solid. I would choose a cream and the tradewinds collection by lily ashbury! IT's such a fun collection. Thanks for the giveaway, hoping it's open to Canada! What a neat book! I think I'd try a pattern from it in yellow, blue, and green pezzy prints, and a Kona white background. I would use fabrics from London by Makower UK line. Especially using the Stripe in Britain, and the Crowns in Red. Maybe it will give goodluck to USA in the summer olympics in London! 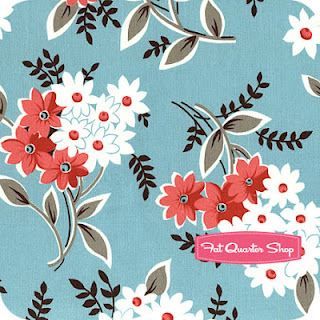 I would take some Riley Blake Sugar and Spice fabric and mix it up with Michael Miller Aqua Red Colorstory. I'd use Kona Snow to keep it from getting too busy. Thanks for the giveaway.